KHARTOUM, Sudan — The presidents of Sudan and South Sudan, two nations that have been locked in a tense dispute over borders, territory and oil since the south split off and became its own country 18 months ago, arrived in the Ethiopian capital, Addis Ababa, on Friday for a summit meeting intended to speed up an agreement signed between both sides last September. Both presidents were scheduled to meet Friday afternoon, but a report by a Sudanese television channel said the summit meeting was postponed, without giving a reason. The official Sudanese News Agency reported on Friday that a closed meeting was held between President Omar al-Bashir of Sudan, Prime Minister Hailemariam Desalegn of Ethiopia and Thabo Mbeki, chairman of the African Union panel facilitating the talks. The meeting was to be followed by a similar closed meeting with President Salva Kiir of South Sudan, the news agency said. In a statement on Thursday, Secretary General Ban Ki-moon of the United Nations welcomed the talks. “The secretary general encourages both presidents to address decisively all outstanding issues between Sudan and South Sudan regarding security, border demarcation and the final status of the Abyei Area, to urgently activate agreed border security mechanisms, and implement all other agreements signed on 27 September 2012,” the statement by Mr. Ban’s office read. South Sudan became independent from Sudan in July 2011, but a number of issues between both states, including how to share oil wealth, the demarcation of borders and the disputed district of Abyei, remained unresolved. In January 2011, South Sudan shut down oil production, which flows from oil wells in the south through pipelines and a refinery for export in the north. Both countries nearly came to all out war in April 2012 after the south took brief control of the border town of Heglig in the north. Under international pressure and the threat of United Nations sanctions, however, both sides signed an agreement in Addis Ababa in September 2012 outlining solutions for unsettled issues. 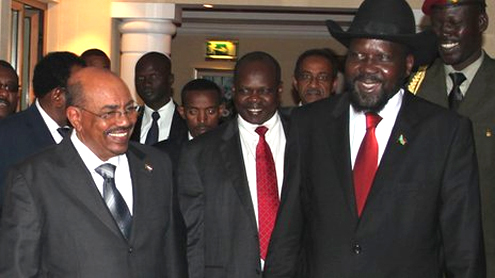 Carrying out the agreement, however, has gone slowly, with Sudan putting a precondition that South Sudan first end its support for rebels inside Sudanese territory, an accusation South Sudan denies. The rebels are active in the Sudanese states of Blue Nile state and South Kordofan, which border South Sudan. The rebels also fought alongside the South. South Sudan accuses Khartoum of carrying out areal bombardments along the border, the last being on Thursday, a day before the scheduled summit meeting. Faisal Muhammad Salih, a Sudanese columnist, believes that despite what appeared to be a lack of political will and the existence of what he described as “extremists on both sides” who want to derail the implementation of the cooperation agreement, a compromise will be reached at the summit meeting. “So I think we will see concessions,” he added. ← What does Atheism offer for people who are suffering?